LOS ANGELES -- If the Dallas Mavericks want a name change, they should consider the Dallas Marvelous. Because the Mavericks were simply just that Monday night, marvelous. They edged the Lakers 96-94 in Game 1 of the Western Conference Semifinals at the Staples Center here in downtown Los Angeles. This wasn't just a routine playoffs win. Nor was it just another Dirk Nowitzki show. This was quite possibly a watershed moment for a franchise notorious for its marshmallow meltdowns. After all, these are the Mavs who lost the 2006 NBA Finals to Miami after going up 2-0 and leading by 13 points with 6:34 left in the fourth quarter of Game 3. With Kobe Bryant getting untracked early, the Lakers stormed to a 53-44 halftime lead. Kobe and his purple-and-gold accomplices would go on to build an imposing 60-44 bulge at the 9:51 mark of the third quarter. Punched in the mouth early, bleeding and reeling, the Mavs didn't just turn the other cheek.This time, they fought back. Hard. "We went to the locker room and felt like we gave a game away," Lakers coach Phil Jackson told reporters in a post-game press conference. Not exactly. It was more like Dallas snatching victory from the jaws of defeat. And it took a concerted team effort to put it together. RIDIRKCULOUSLY GOOD. The Mavs improbable comeback began with Nowitzki, who scored 11 of his 28 points in the final period. The 7-foot Nowtizki, a 9-time All-Star, filled the stats sheet with 14 rebounds, three assists, two steals and a shotblock. And then Jason Kidd sealed it with a turn-back-the-clock performance. Now 38 and slowed by both age and tender knees, Kidd tallied seven points, five rebounds and three steals. He also had, get this, 11 assists. 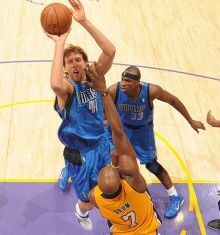 The Mavs bench, led by Jason Terry's 15 and Peja Stojakovic's 10, overmatched their Lakers counterparts 40-25. The Mavs were outrebounded 44-40, but they handily won the assists battle, 30-21. Bryant had a spectacular 36-point total, making 14 of 29 shots. But he missed the one that mattered most -- a potential game-winning 3-pointer which bounced harmlessly off the rim as time expired. "I'm highly concerned. This team can beat us. That's clear," Bryant told the Los Angeles Times after the Game 1. The best-of-7 series resumes Wednesday night at Staples Center. (NRR).